You see your first polar bear thousands of miles away from any actual bears. Going north, Oslo to Tromsø, they spring out at you in ever-increasing densities on jumpers, postcard stands and advertising hoardings. I noticed all of these because the bears are why I was here. I get on a series of three planes – London – Oslo, Oslo – Tromsø, Tromsø – Longyearbyen. I expect the planes to get smaller but they don’t. It is April; every plane north taking me further into lingering winter. In the departure lounge for the flight to Longyearbyen there is a vividly realized picture instructing passengers to ‘Take Polar Bear DANGER seriously’. In it, the illustrated bears worry over something that looks suspiciously like a tourist’s remains. Several people take toothy, grinning selfies with it. Longyearbyen sits at 78.2° north. With 2,144 permanent residents, it is the northernmost settlement in the world with a population reaching four figures. It is, for Europeans, the most accessible part of the high Arctic, and tourism is growing. 39% of the jobs now done on Svalbard are now in the tourism and culture industry, which is worth around NOK 630m (just short of £58m). Yearly nights in hotels on the islands have gone up from around 40,000 in 1996 to 130,000 in 2015 . For my sins, I am one of these tourists. Other than the ever-present hope of bears, key thrills include the genuine possibility of being, at any moment, the northernmost person, say, hopping, or listening to Nick Cave. I am an armchair Arctic enthusiast. You probably cannot name a book on Svalbard or on polar bears that I haven’t devoured, but this was my first actual trip north of the Arctic Circle. It required the purchasing of thermals, serious trousers, and the dusting off of a ski jacket I hadn’t used in a number of years. Even in April, even being one of the fastest warming places on the planet temperatures can still drop into the -20°Cs. Like many of the tourists visiting Svalbard, I am, to put it mildly, not used to these kinds of temperatures. Expecting an onslaught of cold I removed my ski jacket from my check baggage and huddled its bulk under the chair in front of me. In other words, like many Svalbard tourists, I have no knowledge of the Arctic climate, no experience of the challenges, and no ability whatsoever to be independent in this environment. However this is OK. Like thousands of others, I can be shepherded from place to place, to the point even of being driven up a mountain in a belt wagon. There is a level on which I know this is problematic. The first view of Svalbard is sublime. I mean that both in the visceral and intellectual sense of the word. I hadn’t even seen mountains like this. Let alone the ice floes, the glaciers. After years of pouring over pictures and watching documentaries the reality of the place, of descending down the Isfjorden, makes me actually cry. I was surprised and embarrassed by this level of emotion. Glad to be sat alone, by the window, with no one next to me. For centuries, now our lives are safe, we have been asking why it is that wild places inspire these feelings in us, why we are drawn to these inhospitable places. Why they obsess us. It is the same with the bears. There are, indisputably, more images of polar bears just in advertising than there are polar bears in the world. How can I be obsessed with polar bears when I have never seen one in the wild? How can they occupy such a huge element of my imaginative space? There are really two distinct things. The bears themselves, and what they have come to mean and represent to us. Scientists estimate that the total circumpolar population of polar bears is around 25,000. These are divided into several subpopulations, although there is considerable traffic between these groups. The Barents Sea population, including Svalbard, is commonly cited as consisting of around 3,000 bears, although this figure is from a 2004 helicopter survey, and there will undoubtedly have been change since then. A 2015 tally from the Norwegian polar institute put the amount of bears on the islands themselves at 975 (this is broadly in keeping with a 3,000 figure for the whole subpopulation). Before 1973, the Svalbard bears were hunted extensively. Now, thankfully (although potentially futilely, given climate change) they are strictly protected in all parts of the islands . Since these new laws came in, an average of two bears per year have been killed through (alleged) self-defence, or because the animal was sick or injured. There are years that as many as nine bears have been killed (1987). In the same period in Svalbard, there have been only five fatal bear attacks. The details of these (unlike the yearly destruction of the bears in self-defence) are easy to find. We are fascinated by these accounts. Polar bears are the largest land carnivore, they have notoriously been known to stalk humans as if hunting (unlike most other bears, which generally attack only if threatened). 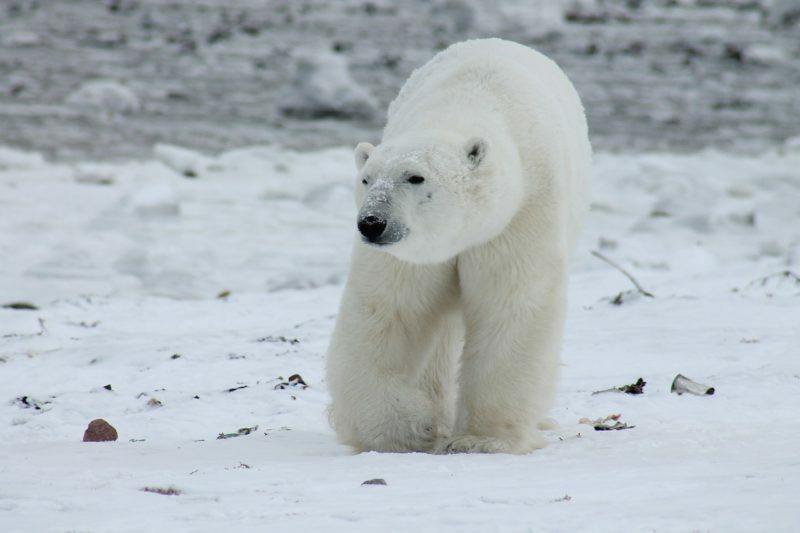 Male polar bears reach weights of between 300-700kgs, with females considerably smaller (150-300kgs unless pregnant). This is a huge powerful animal. Without guns, humans are simply not a match for the bears. So it is the law on Svalbard that outside of the main settlements you must carry a gun or be with someone who is carrying a gun. As we landed the air steward donned a woolen scarf to open the plane door. We descended straight to the tarmac and yes it was cold, but not like I imagined. I pulled on my ski jacket and joined the rest of the passengers in taking picture after picture. Around the period of solar eclipse in March 2015, a group of tourists around 30km outside of Longyearbyen were attacked by a bear while they slept. One member of the group awoke to find it ‘standing over him’ in his tent and received minor injuries. Other members of the group shot the bear with revolvers, which scared it away and injured it, but didn’t immediately kill it. It was later shot by local hunters. The tourist in question, when interviewed in hospital, commented that he hoped to be out in time for the eclipse, which took place the following day. After a four-month investigation, the leader of the group was fined 10,000 NOK (nearly £800) as “They had not put in place the necessary safeguards. There was only one tripwire that was set too high and the bear went under it. Nor did they have a polar bear watch at the time, ”. A trivial amount, for the bear’s life. It is easy to be angry about this. Less easy to conceptualise or to acknowledge emotionally is the devastating impact of climate change on the bears. It would be criminal not to also acknowledge my own role in that (for instance in having taken a total of six flights to get to and come back from Svalbard). The bears need sea ice. The female bears, in majority, also need access to land to den and produce cubs . So, to sustain the current populations the ice not only needs to remain, but it needs to be in contact with denning areas. It is also not just any ice that the bears rely on. Prime hunting ground is seasonal sea ice with many ‘leads’ or areas that seals use to breathe. The polar bear is classified as a marine mammal, but despite considerable swimming abilities, it is not aquatic and therefore reliant on the sea ice to access the seals. Over the past 25 years, the summer sea ice melt period has lengthened, and summer sea ice cover has declined by over half a million square miles. There is less ice, for less time. At the moment this is being most keenly felt in the southern reaches of the bears’ range (e.g. the Western Hudson bay population, which declined by 22% between 1987 and 2004). However, if there were to be an ice-free Arctic by or around 2040, as some predict, extinction or near extinction of the bears would be, surely, likely to follow. Ian Stirling, the much-lauded polar bear biologist, predicts extinction for most of the subpopulations, without intervention, in 30-40 years, primarily because of climate change. I dream about polar bears, often. I cannot quite define what they represent to me. My love of them started, I think, with Iorek Byrnison, the formidable bear who befriends Lyra in Phillip Pullman’s His Dark Materials. I read these books as a child. Since then, I don’t think I have ever been without them imaginatively. I was in Svalbard in the first place to research a book that starts and ends here, with the bears. Although I kept my eyes peeled I didn’t see one. Well. There was the stuffed bear overlooking the baggage belt in the airport. The bear in the museum, lifesize and still. The soft toy at my hotel that sat while I and the other tourists ate food flown in from the mainland. The endless, endless pictures and drawings on shopping bags, on postcards, on vehicles. The image alone is economic lifeblood. In Svalbard, as it is in Churchill. I took a daylong boat trip along the Isfjorden. The mercury that day plummeted to -20°C. Even inside gloves my fingers were painful. I tried to stay out on deck as long as possible, scouring the shore for any sign of a bear. Inside the cabin of the boat, after some hours, there was a sick feeling. Passengers leaned on each other and slept. The smell of the lunch cooked for us (minke whale, salmon, beef) was indelible and queasy. I put up with the cold as long as I could. Making small trips into the cabin to rub feeling back into fingers and toes. Outside things were clear. The sea was black and not as calm as I expected for essentially a fjord. The birds were coming back. Little Auks. Northern Fulmars. Kittiwakes, who nest also near my parents’ home by the Tyne. They skimmed the surface of the cold black water, soon to burst into spring life. It was the day before the midnight sun returned, the next four months here would be without night. But no bears. I watched a bearded seal, its whiskers like split ribbons, look at us pass, safe on the sea ice. 100,000 potential calories for any bear. My being there was selfish. I am not scientist. I wanted to see a bear, I wanted to see their home. Yes I felt dwarfed by the scale of the place – the cold, the mountains, the warming sea. But what value does that have, other than for me. Again, in reverence I am putting my need for sublimity ahead of the aching need to reduce emissions. This is what we do, humans, we put ourselves first and the impact now is terrifying, it pushes me into despair. In his excellent book, Tracking Gobi Grizzlies, scientist and nature writer Douglas Chadwick states that humans and their livestock in 1900 made up 2% of the total land mammal biomass. Now, in 2017, we (and our livestock) make up 90%. The speed and scale of this is terrifying. In His Dark Materials, Svalbard is the kingdom of the bears. There is a profound truth in this. Polar bears may not talk, wear armour, or make friends with small but adventurous children. But it is their world. Or it was. At the end of my week in Svalbard my eyes ached from pressing them again and again against binoculars, scanning a white horizon. The bears stayed away and so, stay in my head. Eloise Shepherd writes fiction, poetry and nature non fiction. She is the co-founder of www.liminalresidency.co.uk, an alternative writer’s retreat which takes place in a range of neglected and unusual spaces. You can read her work in New Writing 13 and the Fiction Desk’s New Ghost Stories anthology. She spends a disproportionate amount of time thinking about bears for someone who lives in Crystal Palace and maintains a surprisingly successful sideline in boxing.